SRG conducted the first independent benchmark study of the Verizon Wireless 5GTF commercial fixed wireless service. For this study, we tested in Houston,Texas, where the operator has deployed a 600 MHz radio channel (six,100 MHz channels) in the 28 GHz band. Samsung is the infrastructure and indoor/outdoor CPE supplier. Our Thanks. We did this study with the logistical support of Accuver Americas who provided us with its suite of drive test tools. We used XCAL-M to log the data and the XCAP post-processing tool for the analysis phase of the study. SRG takes full responsibility for the data collection and the analysis provided in the report. Our Methodology. We logged chipset diagnostic messages while testing in a large number of locations in the vicinity of where Verizon had deployed 5GTF access points (APs). We used a combination of FTP file transfers and Internet applications to generate data. Although we tested at a few locations adjacent to the AP, most of our testing involved more challenging conditions, including NLOS and/or distances of multiple blocks away from the AP. In many cases we believe we tested outside of the intended coverage area of the AP. The Results. Consistent with the results from our initial study in January, we found that millimeter wave signals are far more resilient than we expected. We obtained usable signals, despite tree foliage, buildings, and no clear view of the AP, which we observed was always mounted on a utility pole. With a signal present, the data speeds were almost always within the advertised data rates and equally impressive in the uplink. Latency was 10 ms, plus or minus a couple milliseconds. Take the 5G Availability Challenge (Win $$$). We’ll pay your mobile bill for a year and buy you the mobile phone of your choice if you come closest to guessing when SRG HQ gets 5G services, along with the measured data rates we obtain. We are serious. A Must Read. 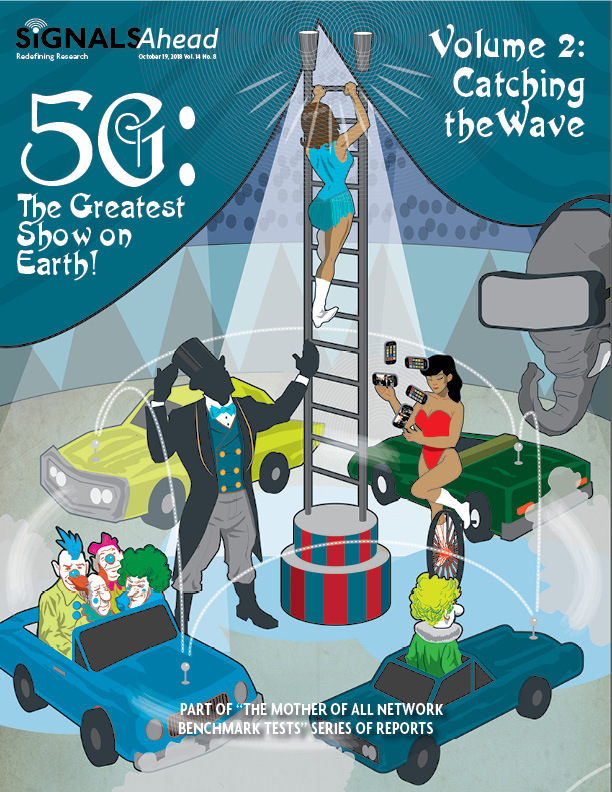 This report is a “must read” for any organization interested in 5G millimeter wave performance and the promises of 5G. Although this study was specific to the fixed wireless use case, the prospects for 5G NR are promising for eMBB, which we believe is technically and logistically easier to support.